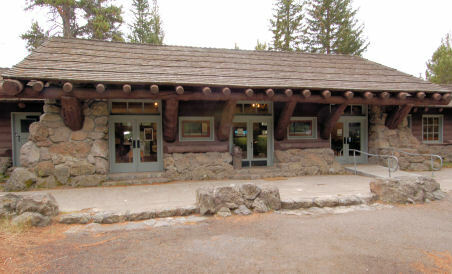 The Fishing Bridge Visitor Center is located in a 1931 National Historic Landmark modeled loosely after the early 20th century "parkitecture" prototype meant to reflect the rustic qualities of its surroundings. National Historic Landmark building that is now a prototype for many NPS visitor facilities across the country houses the area's Visitor Center and a bird museum. The building's status as a National Landmark reflects its ties to Yellowstone's early history as the country's first national park. Designed by Herbert Maier, the museum is constructed mostly of stone and log. Giant boulders flank the sides and support the interior. Stone terraces and a series of carefully placed steps link the museum's entrance and the lake's shoreline. Stone ledges offer comfortable sitting areas for viewing birds and wildlife, and nearby walkways and trails link the museum with a lake and an amphitheater that provides nightly presentations on naturalist topics. 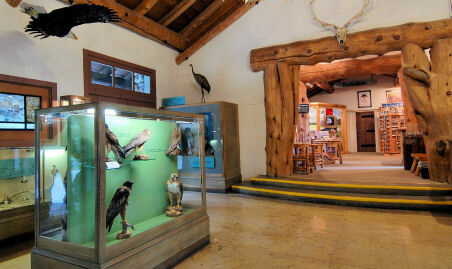 The building includes offices, a mounted bird museum, exhibit area and small living quarters that have in the past, served as seasonal quarters for a resident naturalist. The east wing of the visitor center houses a Yellowstone Association bookstore, featuring books, cards and memorabilia about Yellowstone. Nightly slide shows on various naturalist topics are offered at both Fishing Bridge and Bridge Bay's open-air amphitheaters throughout the summer season (presentations, which range in topic from bears to birds begin at 9:00-9:30 depending upon time of season; visitors should check the Yellowstone newspaper or call the visitor center for exact hours). The center is located on the lake's shoreline, adjacent to the nearby facilities of Lake Village and Bridge Bay. Location: East central Yellowstone, 79 miles west of Cody on U.S. 16. Seasonal hours: Late May-September, 8:00 - 7:00 daily. Accommodations available: RV (hard-sided) camping at Fishing Bridge (no tents); hotel and inn accommodations at nearby Lake Village. Other services: Ranger station with backcountry office (permits available), visitor center, bookstore, museum, stores, restaurants.